Nowadays, there are more and more people, who are eager to invest in experiences more than things. People like to travel, discover the places they have never been to before, experience new activities, visit new events, develop themselves, and just have a great and memorable time. Even this sphere of human’s life was touched by mobile app development. Event app industry is constantly increasing, offering new apps, which enable to discover numerous different events nearby relating to the most various areas, from business and professional meetings to music concerts and parties. This way, while event application development makes it so much easier to find the events due to its users’ interests, preferences, and location, it can be a really profitable business for its founders and the way to realize new and creative ideas. Moreover, according to Statista, the value of the event management software (EMS) market worldwide is going to increase from 6.2 billion U.S. dollars in 2016 to 8.66 billion U.S. dollars in 2020. So, investing in developing event app may be a wise decision and bring its owners successful outcomes. On the whole, there are different kinds of event apps, which are created for discovering various events nearby as well as posting them there, and differ due to their functionality and technical specifics. They can be called ‘event planning apps’, ‘event discovery apps’, ‘event finder apps’, etc. So, let’s take a look at the apps which have established themselves on the market and are the quite bright representatives of the event app industry. Eventbrite is often used as an example of a successful event planning app. It is simple to use, has a solid number of useful features, free registration, and high level of popularity. With the help of this event planning tool, you can discover events and purchase the tickets for them throughout the world as well as create your own one and sell tickets for it. From one single dashboard, you can create, edit, design, and manage your event and all the sales and marketing needs for it. After signing up for free, you start by adding your event, filling all the essential details about it, from the name and description of the event to organizer’s name and description. Among ticket options, you can choose free ticket, paid tickets or donation. When you opt for paid tickets, Eventbrite takes some percentage from it. So you get charged when you make a sale. There are also options to create early birds tickets or different discounts. Since the consumers receive e-tickets, there is no need to use paper and it is a little input in being ‘eco-friendly’. Of course, there is no need to create your own PayPal or merchant account – it is done for you. Moreover, Eventbrite offers choosing themes or creating custom designs, so you can design your event the way you like. Besides, this app has powerful promotion tools. You can send email invitations, publish your event to social media channels, put different widgets, such as buttons, ticket forms, event pages, or even countdown on your website, add affiliate programs, tracking links and, eventually, analyze how it all functions. Eventbrite is available both for iOS and Android users. 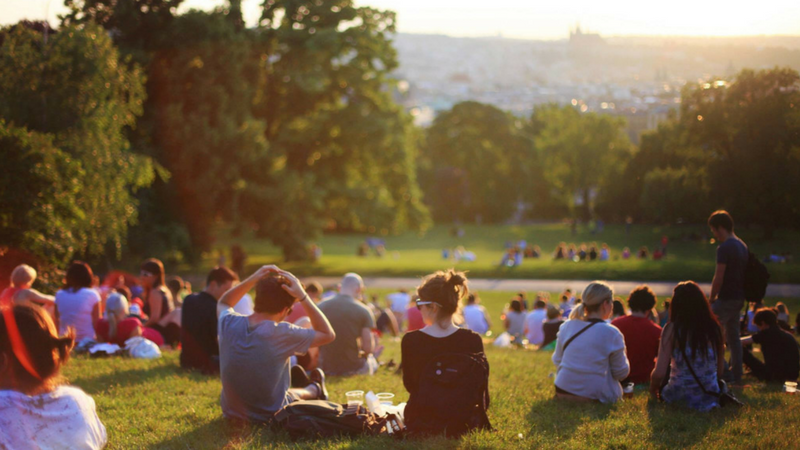 Meetup is about finding communities and events with the same interests. This event app claims it ‘brings people together to do, explore, teach and learn the things that help them come alive’. Meetup offers a huge diversity of categories and groups available. There are groups and meetups for those who are interested in technology, health & wellness, sports, photography, arts, cinema, dancing writing, career & business, and many more areas. 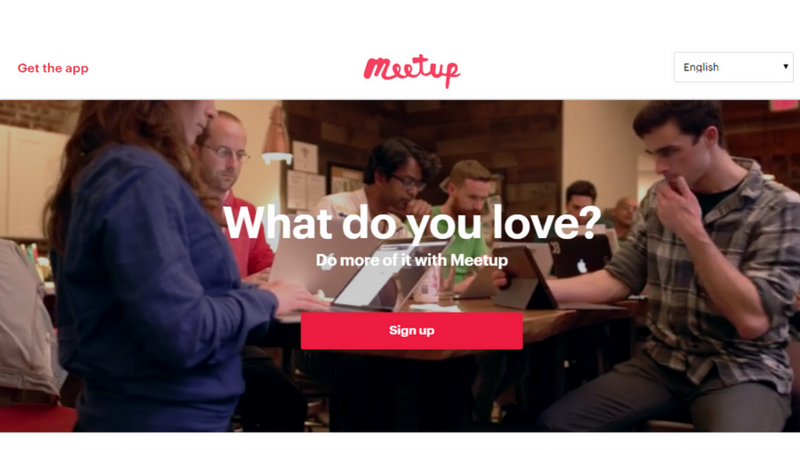 Covering so many sides, Meetup can be used for social, developmental, professional, and business reasons. When using this application, you can both discover meetups available in your area and create yours. For exploring events, you choose your city, distance within which the event should take place, and a category you are interested in. What you get is a list of all the groups, which suit the requirements you entered. You can filter your search starting from the best match, most members, the closest, and the newest event. Every group in the list has a page, where you can get acquainted with more detailed information about it, such as description, members, photos, number of group reviews, past meetups, upcoming events, and many more. Creating Meetup account as a member is free, but in order to manage Meetup group, an active organizer subscription plan is required. Prices differ depending on a plan you choose: Basic or Unlimited. Basic plan starts at $9.99/month for 50 members and 4 organizers, while Unlimited plan starts at $14.99/month for unlimited number of organizers and members. The application is available for iOS and Android users. HeyLets is a community-driven event application. With a huge base of shared impressions, this app may remind a social network, since it is all about sharing recommendations. You can discover events relating to different types of categories, such as food, sports, shows, nightlife, outdoor activities, etc. built on personal recommendations from the real experiences of HeyLets users. You are free to choose you interests within 45 categories available. Based on your preferences, you get a customized feed of various experiences, recommended by those, who have similar interests to yours. In addition, it is possible to make a wish list of the things you want to try. If you are eager to share your experience, you can do it just by adding your impressions concerning particular event, naming a place, and uploading a photo. Moreover, in order to make it more effective, the number of words in description is limited to 200 characters. HeyLets is free and available for iOS and Android users. 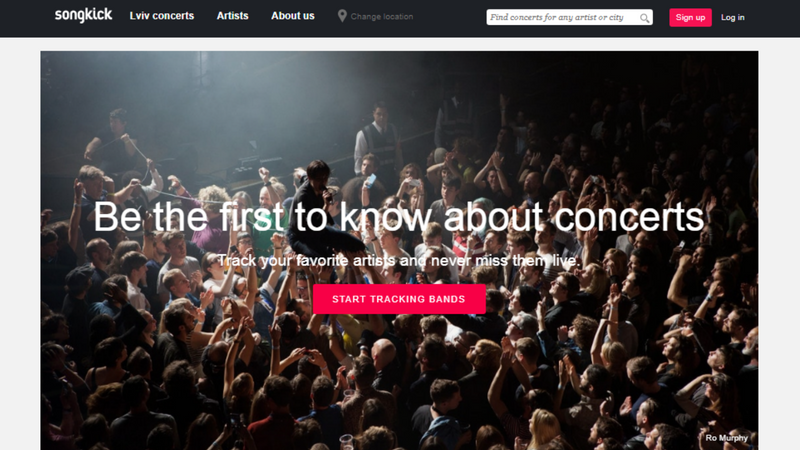 Songkick is all about concerts. With more than 15 million users worldwide, this app enables tracking their favorite musicians, finding out about their concerts, and buying tickets for these events. There is a personalized concert alert feature, which means you are getting notifications, when your chosen musicians throw a concert nearby. If you are travelling, you just change your location and receive concert alerts related to the place you are located in. For the information about your music preferences, Songkick offers using music libraries from Spotify, Facebook, Apple Music, etc. and importing your favorite artists from there. You can also create you concert calendar with the concerts you are interested in. This way, you get the opportunity to be always aware of your favored music artists’ performances and will not miss attending them. The app is free, available for Android and iOS users, and its website can be used for creating user profile, adding preferred musicians, and link it to the mobile account. All the apps highlighted above have their own specialities, which let them capture their target audience and market niche. At the same time, there are the features, which are necessary for a good event planning app. So, which features are ‘must-have’ for this kind of mobile applications? When it comes to events search, the location is crucial because users will be interested in the events nearby, so the app should provide integration with maps and geolocation services. Different search filters boost convenience in using apps and make it so much easier to find what users are looking for. Having a personal menu with favored events, artists, interests, and preferences and being able to create wish lists comes in handy for the users. A lot of events are not free and require booking or purchasing tickets. This away, it is necessary for event planning application to have such a feature and provide the ability to buy tickets and book events. 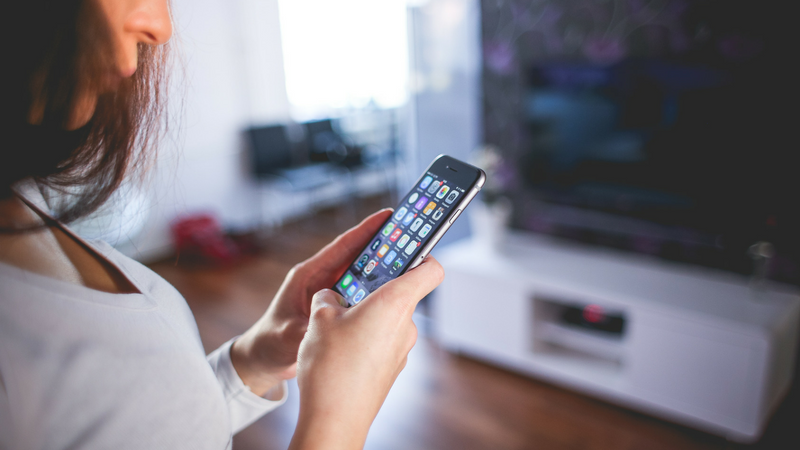 It is hard to remember everything, which is why people need push notifications and alerts for reminding them about interesting and upcoming events. Still, it is very important not to cross the line and send too much information, which can be considered spamming. Users should see published events, what is going on, and which events your app can suggest them. Giving suggestions depending on the location, interests, event history, and also from people you know or follow makes search results more personalized and relevant for the users. Social media accounts, such as Facebook, Twitter, or Instagram, are often closely connected to people’s lives; that’s why integration with them will make your app more attractive and user-friendly. It is good when there is opportunity to leave feedback and give opinion about the events you have attended, so users are able to share their impressions and find more information about the event. Beyond a doubt, the trend of attending events is not about to slow down, but only increase. At the same time, statistics says that event management software market will generate much more revenue in the next years. So, it means that coming up with an idea of your event application has all the chances to lead to success. For this reason, you need to investigate the industry market and competition there, define the features set of your future app and its competitive advantage towards other players in the market, and, of course, hire a team of developers to bring your vision to life. Hopefully, this article has given you relevant and useful information and will help you on your way.